The standard Pallof press (or cable press) is probably one of my favorite exercises. Well, Nick Tumminello has taken this exercise and added to it. He has taken the traditional exercise and added a frontal plane component and a sagittal plane component making this a tri-planar exercise. Check the links out for great stuff from Coach Nick. Here is a blast from the past – this was my review of a phonophoresis study that has been one of my more popular posts. Another blog that you may not have checked out yet is Charlie Weingroff’s blog. Charlie is a DPT, ATC, CSCS and he always has thought provoking material on his blog. Make sure the check it out. Barefoot running seems to be a raging topic everywhere you turn. Here is a blog post on Mike Reinold’s blog discussing this topic. With this topic, and seemingly every other trend in the field of sports medicine, people have a tendency to go overboard. I don’t remember the exact quote from Alwyn Cosgrove but he talked about a pendulum and how people have a tendency to go to the extremes of one side or another and the answer is probably somewhere in the middle. If you are a baseball fan, I am sure you have paid attention to Stephen Strasburg’s injury. What a shame. And yet, do things like this curb the way our youth train and participate in sport – even though they head down a similar path. Eric Cressey has a good write-up on his thoughts about this case. Finally, here is an article that was posted in the local paper this past weekend concerning concussions. I was disappointed in the article to say the least. There were some signs and symptoms and precautionary measures sandwiched between an account of a former player who reportedly played in a game after suffering a concussion and a poll (not a study as indicated) of coaches and how they handle the situation of concussions. The most shocking thing about the article is that the player said that if they had to do it over again, he would have done the exact same thing. Kids reading that are going to disregard the experts and even the coaches and listen to what a fellow student-athlete says. Please take a read of the article and give me your comments. Am I overreacting or is this a pretty irresponsible piece? Thanks again, enjoy the great resources, and please share your comments on the concussion article. First, let me say that this idea is totally stolen – I’m not ashamed to admit it. I heard about it from Mike Reinold and Eric Cressey at the Optimal Shoulder Performance course and thought it was an outstanding tip. This tip will enhance your ability to accurately measure ROM in all joints when using a goniometer. Simply go to the local hardware store and get yourself a bubble level. (If you are unable to find a single bubble, get a cheap plastic level and take it apart to expose the individual bubble levels). While you are at the hardware store, get yourself some glue. 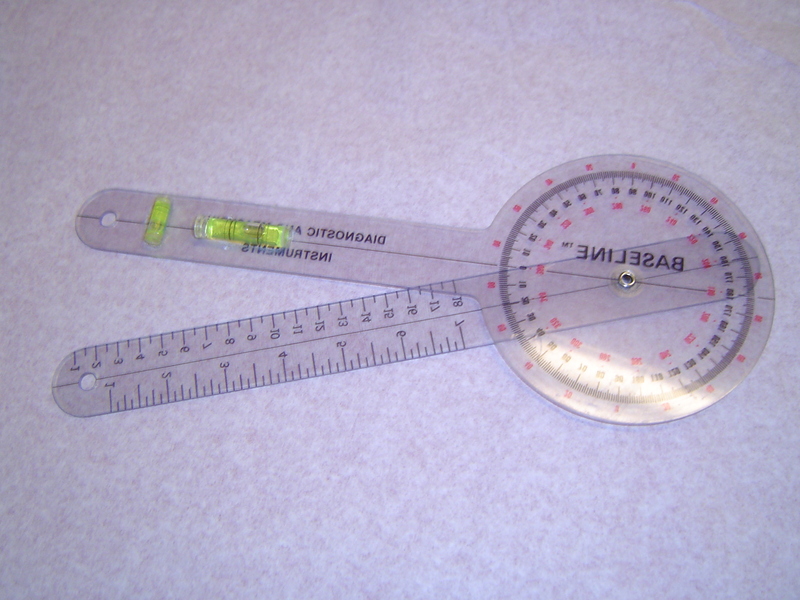 Take the bubble(s) and glue it on your goniometer as shown and you are ready to roll. (Make sure that you put it on the opposite side of the moving arm). Now, with your newly rigged goniometer, you use the level to determine your measurement baseline. So instead of trying to eyeball whether the goniometer is properly lined up, use the level to make that determination. Once you are level, get your measurement and you are all set. The great thing is, by using level to determine your starting point – you will always be accurately comparing apples to apples because you are using the same starting point. You no longer have to guess – level never changes and will give you an accurate measurement every time. This tip will help you to eliminate measurement error and greatly improve your measurement accuracy. Anyone currently use this set-up? What are your thoughts? Any time you attend a conference, you are going to learn some things and unfortunately you are simply going to be unable to retain all of the nuggets shared. So while you do pick up some new skills, there will be some valuable pieces of information that get missed. So with that being said, the other day I received my DVD copy of the Optimal Shoulder Performance course I attended in November. While watching it, I experienced one of those “I completely missed that” moments. It involved proper execution of the sulcus sign. One of the keys when doing this test is head position. In this video, the patient is looking straight ahead – and this is the correct position. Mike Reinold did a nice of job of demonstrating and explaining what can happen if the patient is looking toward the shoulder being tested. People get curious and want to see what in the world is going on with their shoulder. We, even as the ever educating professional, may even want to show them what is or is not going on with their shoulder and encourage them to look at the shoulder as we do the test. While this sounds innocent enough, as Mike explains, turning the head causes the upper trap and additional muscles around the shoulder to tighten and tense up. As a result, when you perform the sulcus sign on the patient with the head turned toward the tested shoulder, you most likely will get a negative result. The tightening of the muscles causes motion to be reduced and the real result of the test is possibly altered. Therefore, you could end up with a false negative test while proper execution of the test may actually reveal a positive finding. Make sure the patient is looking straight ahead as shown in the video. As a result, the shoulder musculature will be relaxed and a true test result will be generated. One of many great tips on the DVD I figured I’d share. So remember – tell the patient to look straight ahead and relax – you’ll get a much more accurate test result. I ordered my copy of Optimal Shoulder Performance yesterday. I attended the course in November and look forward to reviewing the material and relearning some of the great information that may have passed me by initially. One comment about this product and other multimedia presentations in regards to Athletic Trainers and CEUs that most people in our profession have a poor handle on. Most ATCs are misinformed about what educational materials they can actually utilize in order to acquire their CEUs. They simply think that if an educational course does not have CEUs assigned to it or is offered by a non-approved provider, that they can’t get CEUs for it. So they pass the opportunity by and miss out on a potentially great learning experience. Unfortunately, this is incorrect. Educational materials such as DVDs or seminars sponsored by non-approved providers can count toward your CEU total under Category D. Each ATC can acquire 20 CEUs in this category every three years. I wrote a detailed post on this subject previously and you can also check out the BOC guidebook for Continuing Education here. So don’t disregard those Category D opportunities. And make sure you order a copy of the Optimal Shoulder Performance DVD as well – you won’t be disappointed. Take care and have an awesome Easter!!! Here in the Midwest with several inches of snow on the ground and March Madness almost upon us, it is hard to fathom the nearness of the baseball season. But it is coming. So with that in mind this post is a small collection of strategies for you as an ATC covering your local high school team to consider for this upcoming season. Turning-on the Rotator Cuff Prior: Getting the rotator cuff ready to go is more than just some static stretching or long toss. Getting the cuff ready to go in order to center the humeral head during activity is important. Dynamic stabalization exercises involving some light pertebrations with the shoulder in various angles and planes of motion is a great start. At the high school level, this may be tough for just one person. This could be done with partners with some sound coaching by you and close monitoring. The Bodyblade will also serve as a great tool for this as well. Again, prepping the cuff prior to overhead activity is important. So that will be a key point of emphasis for you to relay. Similarly, after practice or a game, light stretching is equally important. Evidence demonstrates immediate loss of motion particularly in Internal Rotation following pitching and so gently stretching following (employ for position players as well) a practice or game is important to implement. Again as a high school ATC, it is going to be tough for you to get your hands on all of these players so using the sleeper stretch as a tool to help maintain internal rotation ROM is a viable option. The key point to remember with this stretch is that it is GENTLE and so extensive coaching by you again is going to be needed initially. The goal is not to touch the hand to the ground. More in the case of this stretch is not better. This is not a stretch they should feel in the anterior shoulder. Light pressure in this stretch following practice and games can be a helpful strategy to maintain (not gain) motion throughout the season. In terms of general assessment, understand that total motion is more important in the big picture. So when assessing internal and external rotation of your baseball athlete, having an increase in external rotation and a deficit in internal rotation compared to the “normal” population will be normal for the baseball player, especially the older they get. The key is to measure the total motion (IR + ER) and compare to the TOTAL MOTION of the non-throwing shoulder. If the total motion is the same, there is no need to try and give somone that extra internal rotation. Now if the total motion is markedly different, that is another story. So just keep in mind that with baseball players you may see more external rotation and less internal rotation on the throwing arm compared to the non-throwing when looking at those isolated motions. Look at the big picture and understand that total motion (which give or take is going to be near 180) of the joint is a more accurate gauge of joint health. Understand that once the rotator cuff becomes inflamed, it shuts down. So it is important to monitor your athletes and employ some of the above strategies to help prevent this. Once the cuff shuts down, it can’t effectively center the humeral head any longer and you start running into a host of problems. Listen today to Mike Reinold’s interview on SportsRehabExpert.com – it will probably be up for one last day – make sure you listen – some great information. Finally, make sure that you regularly read the blogs of Mike Reinold (Boston Red Sox Head ATC) and Eric Cressey(Strength and Conditioning Coach and expert working with baseball players). These two are a heck of a lot smarter than me and are experts in the field. They constantly post great information on their blogs and are a great resource for any ATC – but especially the high school ATC who has rather limited resources. Take care and for those still looking at inches of the white stuff, think spring! If you haven’t been listening in on the interviews at SportsRehabExpert.com, tonight is a great time to start. The series has been excellent thus far and tonight’s guest is Mike Reinold. In the e-mail notification sent out by Joe Heiler (interview host) regarding the interview, he stated that Mike would also be discussing external vs. internal impingement among other things. This is a very interesting topic that is certainly worthy of a listen in and of itself. So don’t miss out on what promises to be a great interview – and if you can’t hear it live, the site will carry it for 48 hours following.